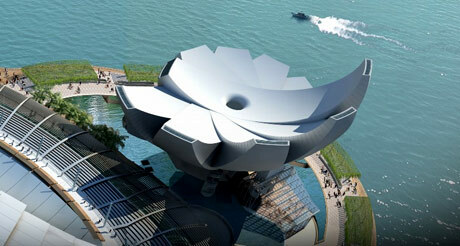 The Art Science Museum has just opened at Marina Bay Sands Singapore. 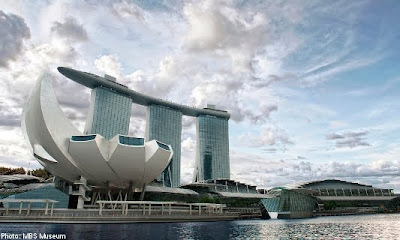 Designed by renowned architecture Moshe Safdie, it has been called the "Welcoming hand of Singapore." Safdie and his team crafted a series of 10 fingers that radiate out from the centre of the building. These fingers progress in both size and height around the centre of the building forming the third and fourth floors and the tallest finger stands 60 metres above ground. All in all, there are 21 gallery spaces totaling 50,000 square feet. On show now are 3 travelling exhibitions " Traveling the Silk Road", "Shipwrecked: Tang Treasures and Monsoon Winds" and Genghis Khan : The Exhibition.